By Julie A. Mujic, Ph.D.
As I fought to recover from the shock and trauma of the 2016 presidential election, I struggled to figure out how to participate in moving the cause forward. I know that as a professor, I am training the next generation but I want to make an impact in a more immediate fashion. I want to be part of the change now, in addition to educating those who could make change in the future. I ask myself every day whether I am living up to its words. As a historian, woman, and American, I embrace my responsibility to understand and use the past to motivate me to be the person I want to be in the future. But in the wake of this election, who could I be and what impact could I have? I have never been involved in politics, outside of a few voter registration stints in college and leading up to this election. Faced with the reality of an impending inauguration day, I felt like I was flailing in a dozen different directions trying to find my voice in this political chaos. Should I write for news or popular publications like some of my colleagues? Should I blog? Should I run for office? Should I join some kind of non-profit liberal agency? Should I make a donation? Should I work for a campaign? How on earth could I translate my Ph.D. in History and my years of teaching and writing experience into something valuable that would contribute to the Resistance? In the end, I decided to start at home. I live in Delaware County (Ohio), which is the fastest growing county in the state and has the highest median income. It has voted Republican for over 100 years but some political pundits believe it could be flipped in the near future. Trump’s margin in my county was much smaller than it had been for Romney or McCain, so maybe my work in this space could make a difference quickly. Figuring out how to do that took a few intentional steps. I found the Indivisible page for my congressional district on Facebook and pushed myself to learn the jargon, the methods for resistance, and the names and faces of important people in my community. I discovered the League of Women Voters, a very active organization in Ohio, and other groups and individuals crucial to the kind of progressive work in which I wanted to participate. I also had lunch with the chairman of the Ohio Democratic Party, David Pepper. He invited me to give a Lunch & Learn talk on Ohio political history to the ODP Headquarters staff in May. During that Lunch & Learn, we discussed Ohio’s historical role as a bellwether in presidential elections and the current threats to its future significance. I was able to draw connections between Ohio’s past economic and social trends to key challenges facing the Democratic Party and the state as the 2018 midterm elections approach. Pepper also confirmed my growing understanding about the significance of county politics and he encouraged me to play a role in that sphere. In February, I came across an article that explained that there were many available seats in county Democratic Party Central Committees. What exactly do Central Committees do? Well, as I learned after some additional research, they function as the county party leaders. 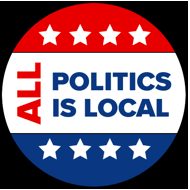 They run communications, raise money, endorse candidates, and initiate a number of other important functions that keep county politics vibrant and attract residents to the party. I checked it out and discovered that my precinct’s Central Committee seat was open. I had to attend three of my county’s Central Committee meetings and then I could “run” for the seat. The only requirement was that I could not have voted Republican in the last primary. I did not, so off to the meeting I went! At that first gathering, there were at least 12 new people in attendance. As a new attendee, I stood and introduced myself. It was nice that they took the time to recognize those who were new to the group. Then we got down to business. Among a long list of discussion topics for the night: the county’s role in vetting gubernatorial candidates for 2018; an upcoming drive to get an amendment prohibiting gerrymandering on the fall ballot; and promotion of Issues & Policy Chats, which are held once a month and are open to the public (the March chat focused on Planned Parenthood). We also discussed fundraising with the express goal of being able to contribute to campaigns in the future. As a Committee member, I can choose whether or not to be involved in subcommittees and how much time to dedicate to the work. I was surprised by how many precinct seats were available in my county, so I decided to get involved with the subcommittee that is aiming to fill them. In a historically Republican county such as mine, filling precinct seats on the Central Committee has not seemed possible in the past, but the creation of this new subcommittee suggests that it now appears attainable. I am reaching out to registered Democrats in each precinct and inviting them to consider seeking a position. I will also be implementing ideas that experienced residents have already “road-tested,” including having “Blue Block Parties” and using Facebook to create networks of like-minded neighbors in my own precinct. In taking part in these monthly Central Committee meetings, I am learning how the county plays a role in publicizing elected positions available in their city/township/county, such as city council, township trustees, school board, etc. They focus on identifying potential candidates and encouraging those who are interested in running, with the intention of building the bench for future elections. They also provide training and informational resources regarding campaign strategies and tactics and keep candidates informed of rules or laws that apply to their particular race. The events calendar speaks to the range of activities the Committee sponsors. The Central Committee also coordinates with other related groups in the county. In particular, the Young Democrats invite anyone under age 40 to their monthly meetings and events, and their leaders also come to Central Committee meetings to keep us posted on their activities. Furthermore, as candidates declare for 2018 election spots, they have started to come to the meetings and introduce themselves. In June, we hosted a candidate for State Treasurer who made his pitch to a supportive crowd. I was able to attend my second meeting in June, and I am learning about the political process among friendly, helpful people who are happy to take me under their wing. The July meeting is the annual fundraiser, featuring guest speaker Aftab Pureval, an up-and-coming name in the state political scene. My third meeting – convening this August – will be eventful for me personally, as I will be officially named to the Committee. I am truly looking forward to it. In the meantime, I meet with my subcommittee and participate in its work on my own schedule. County politics seems like the best fit for me right now – the time commitment is under my control, the financial commitment is minimal (just annual dues to the county party), and I am growing intellectually in a new way. I am building a foundation here and keeping my eyes and ears open to figure out what I might be able to do in the future. I know that I cannot run in a hundred different directions and fix every problem. In January, I thought that was what I had to do. I was driven by emotion, filled with anger and despair. Now, I am calculating; I am facing the problems and making my voice heard in a situation that fits best with my personality. I like to be social, I like to solve problems in groups, and I like to see the short-term and long-term impact of my actions. Being involved in county politics is allowing me to do all of these things. Someday, my resistance may extend far beyond these borders, but I am very proud of this significant first step. The recent election showed me that counties are more important than I previously anticipated, and I feel like my time and effort spent in this arena will reap benefits in the years to come. If this kind of activism seems like something you would like, contact your county party office. They will be able to tell you whether your precinct seat is available or whether you can join the Central Committee as an At-Large member. It is a great way to jump into the game and find your political voice. Julie Mujic is currently an Adjunct Professor at Capital University and a freelance indexer. She is also on the Board of Trustees for the Columbus Historical Society and she publishes mainly on U.S. Civil War history. You can follow her on Twitter at @JulieMujic and reach her at jmujic@capital.edu. Thanks for a great article. It’s informing, interesting, and inspiring. I live in Franklin County so not as able to make an impact. it sounds like you are well situated to possibly make a difference in Delaware County- good luck! I agree completely. My husband and I are active members of the San Benito County Democratic Central Committee. Watch out for power plays and dirty laundry–just like any other group–and it is a great way to make a difference you can actually see.